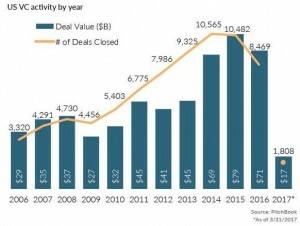 VC investment activity jumped in 2014 by 53% over 2013, growing from $45 billion to $69 billion. The market has sustained momentum with $79 billion in 2015 and $71 billion in 2016. 2017 activity is anyone’s guess at this early stage. 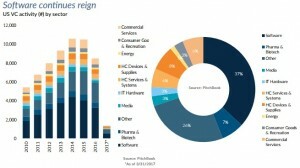 Software companies are some of the biggest consumers of data centers. For Q1 2017, 37% of transactions occurred in the software market. In Pitchbook’s taxonomy, “software” is comprised of everything from social media sites, SaaS, Cloud, and traditional on-prem installed software. Also for Q1 2017 seven of the top 10 financings were for the software category (Airbnb, SoFi, Instacart, letgo, DraftKings, and Zoom Video), and three of the top 5 IPOs were software(Snap, MuleSoft, and Alteryx). Considering the heavy focus on the software sector, it’s not too surprising that the majority of deal activity in the west coast tech sector states of California, Oregon, and Washington. 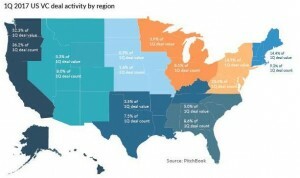 Pitchbook’s full report can be downloaded by clicking here.